To create a new stored procedure, right-click the Stored Procedures node under the connection node in Server Explorer. From the node's context menu, choose the Create Routine command. This command opens the SQL Editor. To create a new stored function, right-click the Functions node under the connection node in Server Explorer. From the node's context menu, choose the Create Routine command. To modify an existing stored routine (procedure or function), double-click the node of the routine to modify, or right-click this node and choose the Alter Routine command from the context menu. 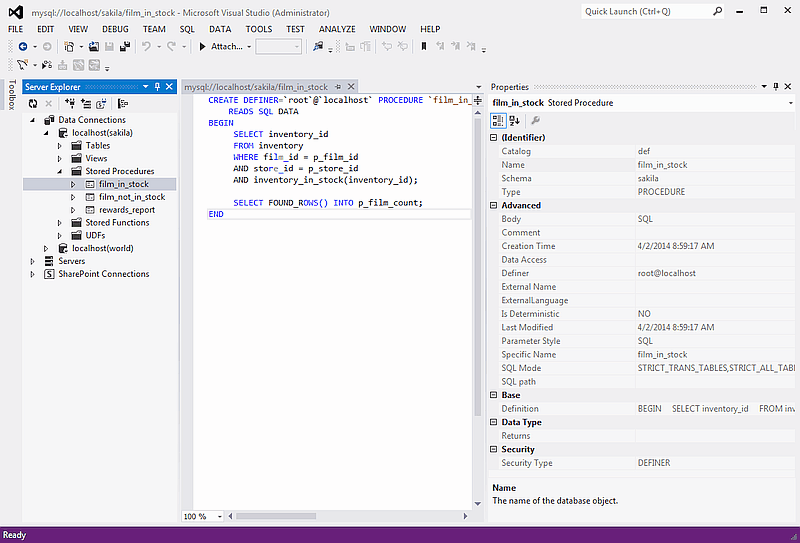 Either of the commands opens the SQL Editor. Some of these properties can have arbitrary text values, others accept values from a predefined set. In both cases, these values cannot be set from the properties panel. You can also set all the options directly in the SQL Editor, using the standard CREATE PROCEDURE or CREATE FUNCTION statement. 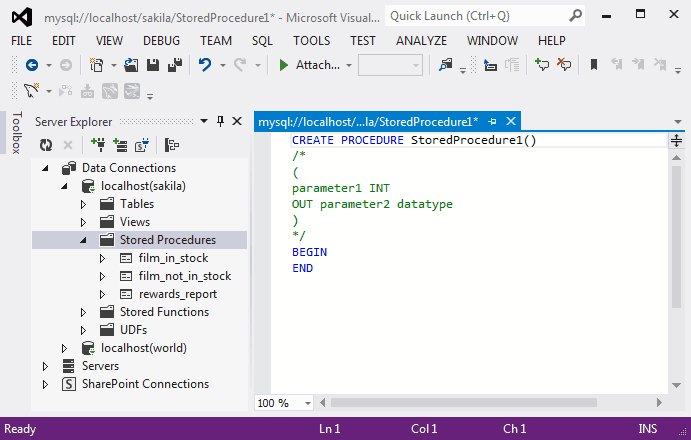 To observe the runtime behavior of a stored routine and debug any problems, use the Stored Procedure Debugger. For additional information, see Chapter 11, Debugging Stored Procedures and Functions.